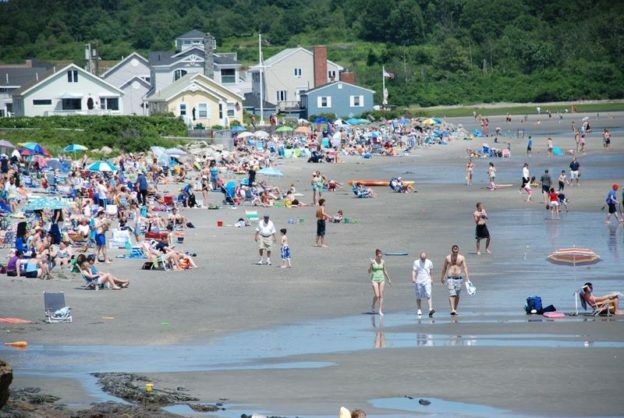 Located an easy 15 minutes south of Conway’s home in Portland, Higgins Beach stretches for seven tenths of a mile along Saco Bay in Scarborough. Conway loves how “friendly” the beach is, a word he uses to refer to both the constant supply of gentle waves and the exceptional camaraderie among the surfers. Surfers often discourage beginners, but everybody cheers for each other at Higgins. “It’s really refreshing,” he says. In the peak summer months, surfing is forbidden from 11 a.m. to 5 p.m. when the beach is usually full of families and young people, so surfers have to go out early in the morning or at the end of the day and must park some distance away. From the beginning of June through the end of September, the small neighborhood of 350 simple cottages with weathered clapboard siding and names like “Spindrift” and “Green Bean” fills up with tourists who come in from away, often paying more than $1,500 a week to rent out even the cozier cottages. In the winter, however, it’s a different story. The parking and time restrictions are gone, the beach’s two inns are closed, and The Higgins Beach Market, the only store in the neighborhood, is shut down. Oceanfront homes go for as little as $1,000 per month during the 8-month off-season, less than a sixth of what they are in the summer. It’s free reign for winter surfers, and they aren’t the only ones. Scott Townsend, a local real estate agent, says that living at Higgins Beach in the winter seems to work well for many people relocating to southern Maine or going through transitions in their lives as well as young people looking for a temporary and relatively cheap place to live. The area has also become a popular place for the owners of the cottages to retire. As she served hot coffee in Styrofoam cups at one of the Higgins Beach Association’s weekly community breakfasts, Priscilla Reising described some of the history she has seen unfold on the beach since her family first brought her there as a baby 62 years ago. Although Higgins Beach had been subdivided for development as far back as the end of the 19th century, when Reising’s family bought their first plot of land in 1946, the roads were not fully paved. Local farmers and shopkeepers like Reising’s grandfather, who ran a dairy in Scarborough, could acquire lots for a few hundred dollars and build small summer cottages. As Reising’s family moved on and taxes on the property increased, her family began coming down in June to fix up the cottage and then renting it out during July and August before returning in September to close it out. Over the last few years, Reising and her sister Deedee have been able to spend more time in their houses on Higgins Beach, and Deedee has chosen to make her cottage her primary year-round residence. This article originally appeared in the August 2009 edition of Working Waterfront newspaper and has been edited slightly for style and tone.